From making pasta to creating beautiful magazines, the Wisconsin Union Directorate (WUD) and Wisconsin Hoofers have something for everyone. And you can be a part of it! All 10 student-led committees and six incredible student-led clubs are looking for talented, driven students who are passionate about creating programming and making a difference. In this article, we give you a look into three of these clubs and committees. Do you love to write, edit or do graphic design work? Is music, food, fashion or research your passion? If any of this has you nodding your head, you’re going to love the WUD Publications Committee. The Committee produces seven magazines and journals on everything from fashion to science and technology research. 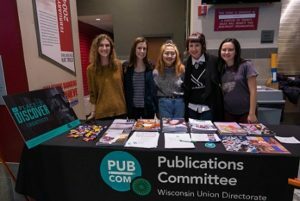 You can find the Committee’s publications across campus, including at Peet’s Coffee in Memorial Union and at the Coffeehouse Lounge in Union South. Click here to learn more about the Committee, including how to get involved. Hoofer Outing Club members enjoy kayaking down a river during an event called Hooferpalooza. Six clubs make up the renowned Wisconsin Hoofers, including the Hoofer Sailing, Scuba, Riding, Ski and Snowboard, Mountaineering and Outing Clubs. 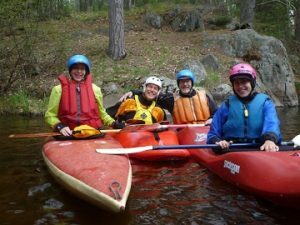 Access to adventures in the outdoors and finding others who want to join you in the outdoors is what each of these clubs are all about. Hoofers also offers more than 150 student leader opportunities with positions ranging from marketing to safety and health administration. Learn more joining or leading in the Wisconsin Hoofers here. Click here to learn more about SoPo. The Wisconsin Union is a place to do many things, from studying in comfortable lounges to attending live music performances. We invite you to come and enjoy the experiences our student leaders create. We’re also a place where you can make an impact. You can help decide what films come to our movie theater, what performers come to the Shannon Hall stage, what art comes to our galleries and so much more. To learn more about coming to an event, joining or a committee or club, or being a Directorate leader, visit union.wisc.edu/get-involved/wud.